Hence, we undertook this study to determine the prevalence of psychiatric morbidity in patients admitted to the Medical Intensive Care Unit (MICU) of a general hospital and to compare the sociodemographic correlates with the different psychiatric manifestations. Thus the needs of these patients could be addressed and the disease burden alleviated. Our study was a prospective observational study carried out at a general rural hospital attached to a medical teaching institute. A total of 100 patients admitted in the MICU when declared medically fit for interview by the treating doctor, just before being transferred to a step-down ward, were included in the study. Written informed consent was obtained from all the participants. Each participant was interviewed by a psychiatrist from the Department of Psychiatry and the data was collected using a specially designed pro forma meant to map the sociodemographic details of the participant, date of hospitalization, medical diagnoses, age of onset of the illness and the illness course, duration of hospitalization, and medication history – past and present. The Symptom Checklist Revised - 90-R (SCL-R-90) was administered to each of our participants. Any participant identified to have psychiatric comorbidity was offered treatment in the form of counseling, psychotherapy, and medications as per individual requirement. A total of 100 consecutive patients admitted to the Medical ICU who were willing to give written informed consent were enrolled for participation in the study. All patients who are unwilling to provide consent or under the influence of drugs that alter mental status or were delirious, mentally retarded, or frankly psychotic patients were excluded from our study. The collected data was coded and analyzed using SPSS 22 software. Frequency, percentages, mean, standard deviation, and confidence interval has been used to present all the quantitative measures. The significance of the difference in proportions and the association was done by Chi-square test. P ≤ 0.05 was considered statistically significant. Binary logistic regression was applied to explore the correlation of risk of psychiatric morbidity and factors such as gender, educational level, and age. Systematic random sampling method for sample selection was employed. Taking the prevalence of psychiatric morbidity as 42.5% with a confidence interval of 95%, considering a 10% margin of error for the estimate, the sample size was estimated as 93%. Expecting a non-compliance of 10%, the total sample size was rounded off to 100. The Institutional Ethics Committee approved the study protocol. Informed written consent was taken from all the participants for voluntary participation in the local language (Kannada). [Table 1] shows that of the 100 ICU patients interviewed as participants for our study, 52% had no psychiatric morbidity. 36% were found to have mild and 12% were found to have moderate psychiatric morbidity as per the SCL-90-R Scale. There was no participant with severe psychiatric morbidity. Our study had 65 male and 35 female participants. The maximum participants were noted in the (30–50) age group and had attained basic education up to 12th standard (38% and 72%, respectively). Of the 100 participants, 12 stayed in the MICU for duration of more than 60 days. Chronic kidney disease was the most common diagnosis causing prolonged stay in 5 patients, followed by uncontrolled diabetes mellitus in 3 patients, chronic obstructive pulmonary disorder, and post-stroke sequelae in 2 patients each, respectively. For easy tabulation, the medical diagnoses were clubbed under infectious, non-infectious, toxicological, and miscellaneous diseases. The highest number of the participants was in the Medical ICU for infectious disorders (40%). Factors such as gender, age, educational level or duration of stay, or the medical diagnoses had no statistical significant association with psychiatric morbidity. The maximum number of participants were in the hospital for duration of 30–60 days range and the mean duration of day was 64.49 days. However, since the distribution of the duration of stay is very skewed, we have used the median and interquartile range instead, as can be seen in [Table 2]. In [Table 3], to test the association between predictors such as gender, education, and age in the participants with and without psychiatric morbidity, primary linear regression was used. None of the predictors showed any statistical association with the presence of psychiatric morbidity. However psychiatric morbidity was higher among female participants as compared to the males. Increase in age seems to increase the risk of psychiatric morbidity as per the odds ratio (1.166). Education had an inverse relationship with psychiatric morbidity; psychiatric morbidity reduced with increase in educational levels (Odd's ratio = 0.779, P = 0.157). [Table 4] shows that among the 48% participants with psychiatric morbidity, interpersonal sensitivity was the most common, followed by somatic and psychotic symptoms. It was uniformly found that all of the symptoms were most prevalent in the mild grade. The prevalence of psychiatric comorbidity in the 100 participants interviewed was found to be 48%. This is in keeping with the findings of previous studies indicating a range from 20% to 60%.,, In our study, interpersonal sensitivity, somatization, and psychoticism were found to be the most common subtypes, while unspecific symptoms, obsessive symptoms, and depressive and anxiety symptoms were also found in more than half of the population with psychiatric comorbidity. In primary care settings, overall prevalence of psychiatric manifestations was found between 23% and 42.5% which is in keeping with our finding. The common manifestations ranged between mood disorders, including major mood disorder and dysthymia, anxiety, somatoform symptoms, and alcohol abuse which is in contrast with our finding., 22% of PTSD symptoms were seen in nearly 22% ICU survivors which are contrary to our findings that did not have a single PTSD case. This might be a limitation of using the SCL-90-R scale which divides psychiatric morbidities into nine primary symptom dimensions or subcategories, namely: Somatization disorder, obsessive–compulsive symptoms, interpersonal sensitivity, depression, anxiety, hostility, phobic anxiety, paranoid ideation, and psychoticism and does not have any provision for diagnosing PTSD.,, Age, gender, educational levels of the patients, and the duration of stay had no statistical significance on the prevalence of psychiatric morbidity. However, primary linear regression reveals that increasing age has a proportionate effect on the prevalence of psychiatric morbidity. Highest prevalence of psychiatric morbidity was seen in the 50–70 years followed by the 30–50 years' age group. The prevalence rate dropped for the population above 70 years. This is reflected by the finding of one study that clearly indicates the prevalence of somatization symptoms is less in the elder population above the age of 65 years. When the correlation of gender was considered with psychiatric morbidity in our study, the female participants seemed to have a higher preponderance compared to the male participants of the study. A similar trend is reflected in a study of IBS and non-ulcer dyspepsia which shows more morbidity (anxiety, depression, and somatic symptoms) in females as compared to the male patients. Patients with increased educational level showed lesser risk of psychiatric morbidity. This is in line with our statistical analysis that shows an inverse relationship between presence of psychiatric morbidity and educational level., Studies further reveal a trend of lesser psychiatric morbidity with employment. However, this was not explored in our study. Psychiatric comorbidity poses a major challenge in the management of long-standing critical patients, worsens prognosis, and increases the likelihood of complications. It can lead to lasting impairment and unduly increase the cost and duration of treatment. Hence, it is imperative that doctors of various specialty, general practitioners, and even medical support staff identify psychiatric symptoms and refer adequately so that the manifestations are timely dealt with and appropriately in the best interest of the patients. This is further supported by a study conducted in critically ill patients that found that early psychologist intervention in the Intensive Care Unit itself reduced the risk of developing anxiety, depression, and PTSD in these patients. It was even found to reduce the number of patients requiring psychiatric medications eventually (41.7% in the control population vs. 8.1% in the intervention group; P < 0.0001). Difficulties were faced in getting compliance of the patients who were already aggrieved with their long-standing illnesses and treatment burden and they were not very patient to undergo the interview. The small sample size may also be a limitation and may not be representative of the entire population. Caregivers also bear a huge brunt of the long-standing and stressful treatment process and have a large degree of psychiatric morbidity. This has not been explored in our study. Psychiatric morbidity is high among patients in Intensive Care Units and severity of presentation is more than that in general medical patients. Identifying them early and prompt intervention may be necessary to reduce the cost, the duration, and the suffering of the patients. The project is a Sri Devraj Urs Higher Education and Academic Research (SDUAHER) funded project. Grandes G, Montoya I, Arietaleanizbeaskoa MS, Arce V, Sanchez A, MAS Group. et al. The burden of mental disorders in primary care. Eur Psychiatry 2011;26:428-35. Toft T, Fink P, Oernboel E, Christensen K, Frostholm L, Olesen F, et al. Mental disorders in primary care: Prevalence and co-morbidity among disorders. Results from the functional illness in primary care (FIP) study. Psychol Med 2005;35:1175-84. Davydow DS, Gifford JM, Desai SV, Needham DM, Bienvenu OJ. Posttraumatic stress disorder in general intensive care unit survivors: A systematic review. Gen Hosp Psychiatry 2008;30:421-34. Hilderink PH, Collard R, Rosmalen JG, Oude Voshaar RC. Prevalence of somatoform disorders and medically unexplained symptoms in old age populations in comparison with younger age groups: A systematic review. Ageing Res Rev 2013;12:151-6. Chaudhary R, Kumar P, Wander G, Mishra B, Sharma A. Psychiatric manifestations among cardiac patients: A hospital based study. Delhi Psychiatry J 2014;17:253-7. Sampson MJ, Kinderman P, Watts S, Sembi S. Psychopathology and autobiographical memory in stroke and non-stroke hospitalized patients. Int J Geriatr Psychiatry 2003;18:23-32. Beltrão SM, Gigante LB, Zimmer DB, Zimmermann PR, Schmoeller D, Batistella F, et al. Psychiatric symptoms in patients with systemic lupus erythematosus: Frequency and association with disease activity using the adult psychiatric morbidity questionnaire. Rev Bras Reumatol 2013;53:328-34. Karia SB, De Sousa A, Shah N, Sonavane S, Bharati A. Psychiatric morbidity and quality of life in skin diseases: A comparison of alopecia areata and psoriasis. Ind Psychiatry J 2015;24:125-8. Padhy SK, Mishra S, Sarkar S, Bang LG, Panigrahi M. Comparison of psychiatric morbidity in patients with irritable bowel syndrome and non-ulcer dyspepsia. Ind Psychiatry J 2016;25:29-34. Derogatis LR, Lipman RS, Covi L. SCL-90: An outpatient psychiatric rating scale-preliminary report. Psychopharmacol Bull 1973;9:13-28. Ardakani A, Seghatoleslam T, Habil H, Jameei F, Rashid R, Zahirodin A, et al. Construct validity of symptom checklist-90-revised (SCL-90-R) and general health questionnaire-28 (GHQ-28) in patients with drug addiction and diabetes, and normal population. Iran J Public Health 2016;45:451-9. Sereda Y, Dembitskyi S. Validity assessment of the symptom checklist SCL-90-R and shortened versions for the general population in Ukraine. BMC Psychiatry 2016;16:300. Prinz U, Nutzinger DO, Schulz H, Petermann F, Braukhaus C, Andreas S, et al. 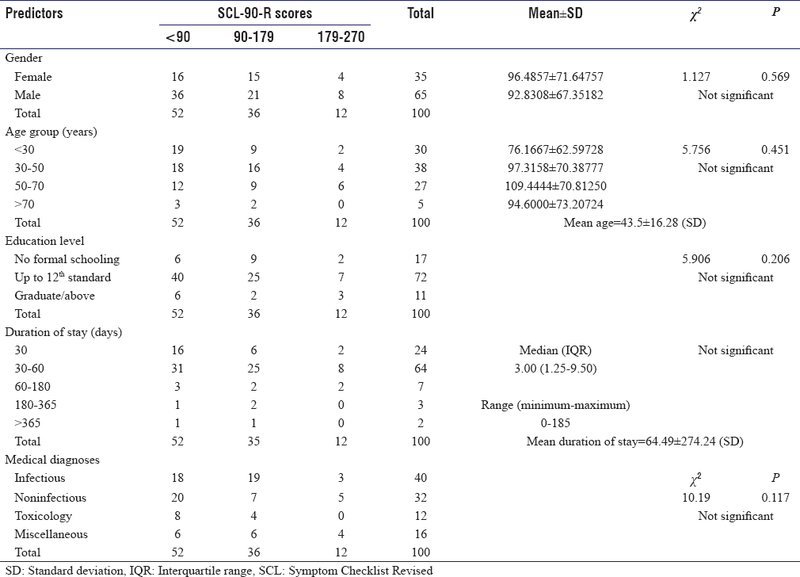 Comparative psychometric analyses of the SCL-90-R and its short versions in patients with affective disorders. BMC Psychiatry 2013;13:104. Peris A, Bonizzoli M, Iozzelli D, Migliaccio ML, Zagli G, Bacchereti A, et al. Early intra-intensive care unit psychological intervention promotes recovery from post-traumatic stress disorders, anxiety and depression symptoms in critically ill patients. Crit Care 2011;15:R41.